Come to sunny Scottsdale, Arizona and spend your time in our state of the art training theater immersed in extensive laser training! Unlike most laser classroom training available, the Esthetic Advisor Laser Academy courses are taught by the exceptionally knowledgeable and experienced professionals who use light based devices daily with their own clients. 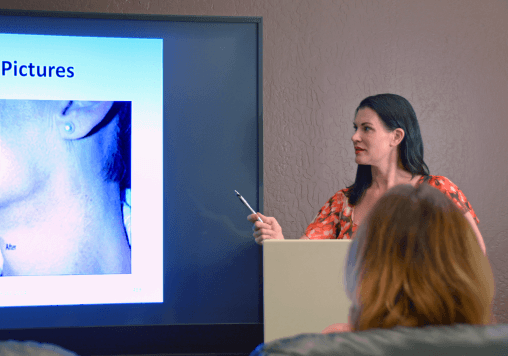 Our instructors are ARRA approved with many years of teaching (literally) thousands of skincare professionals how to safely use esthetic lasers and provide invaluable advice on starting a career in this exciting industry. Our state of the art training theater provides students with ultra comfortable recliners with access to complimentary refreshments. With a maximum of 10 students per lecture class, our 81″ monitor and stadium arrangement make seeing and hearing every aspect of the instruction easy for every student. There isn’t a bad seat in the house! • Many other exciting topics! In order to be eligible for AZ certification as a laser operator by ARRA, graduates of a 40 hour didactic laser course must complete 24 hours of directly supervised permanent hair reduction treatments (a minimum of 10 separate treatments). If a laser operator wishes to perform any other laser treatment in addition to permanent hair reduction, he/she must complete an additional 24 hours of directly supervised hands on cosmetic laser treatments with a minimum of 10 separate treatments per modality (e.g. 10 tattoo removal treatments, 10 IPL treatments, etc.) For those who are not able to complete these treatments under the direct supervision of a medical director, EALA provides an ARRA approved 48 Hour Clinical Laser Operator Course. The 40 Hour Basic Laser Operator Didactic Course and the 48 Hour Clinical Laser Operator Course are offered together as the 88 Hour Comprehensive Laser Operator Course. The 40 Hour Basic Laser Operator Didactic Course is also available online and in a hybrid format for those practitioners not working in the state of Arizona.